It turns out that I don’t watch a lot of television. A recent study reported that the average person watches about 35 hours of television a week. So, being the resident nerd here at bloomfield knoble, I decided to track how much television I watch a week. After a couple of weeks of tracking my time – adjusting for variance to schedules and DVR viewing, I figured that I watch about 16 hours a week. At first I was pleased that I’m not watching that much TV, but my “research” revealed something interesting – it turns out that my frequency is low, but my time spent is really, really high. As an agency, bloomfield knoble develops marketing campaigns that take into account both reach and frequency to a targeted audience. Very simply, if we want a commercial to be seen by X number of people, we have to figure how many people are watching a program at any given moment and then calculate the number of times to show the commercial in order to reach our number. But, as media planners will tell you, it’s never that easy. You have to calculate the number of people watching and then adjust for a different group of people watching and then aim for when the message will have the greatest impact and on and on and on. It’s one of those things that seems easy, but isn’t – which is why bloomfield knoble does so much media planning and buying work for clients. Anyway – back to my viewing habits. What I discovered is that I don’t ‘scan’ television. I don’t just sit in front of the TV and flip channels. I have a few shows I really enjoy watching (The League / Archer / Mad Men / The Blacklist) that I have set up to record, but otherwise I don’t watch shows on TV. What I do watch – my achilles heel – is sports. I will binge watch sports starting with soccer in the morning and then football in the afternoons. So while my overall time spent watching television is small, the amount spent watching in a block is very high. Plotted on a bell curve, the average time spent watching TV in a single block per day is about 2.5 hours. I’m watching a block of about 7 hours. The good news for advertisers is that, when I do watch, I am engaged – meaning that I’m not walking in and out of the room nor just have the TV on for ‘background noise.’ I may be engaged with a second screen – but that’s a topic for a different day. The bad news for advertisers is that my binge watching may affect the relevancy of the ads I see. At bloomfield knoble, we don’t want the same person to see an ad 5 times in a row (as defined by a program block), because it may not be relevant to you. If we run an ad 5 times during an event, we hope that it’s seen by 5 different people (reach) and that the ad is seen by many of those people again (frequency) at a time when it fits better within the sales cycle of the product or service we are trying to sell. So the question really becomes, how can we, as agencies, make TV ads even more targeted to reach the audience while controlling the frequency in order to maximize impact? The answer, it turns out, may be just around the corner. According to Jacob Aron, writing in NewScientist magazine, networks are tapping into our personal data to show us tailored ads. It turns out that TV networks are increasingly using techniques borrowed from online advertising to show different ads to different people in the hope of better targeting customers. It used to be that everyone watching a channel saw the same ad at the same time, with perhaps some variation depending on your location. This week it was revealed that some US networks have started targeting people based on their voting record as political parties attempt to scoop up swing voters. Targeted TV ads are now possible thanks to the rise of smart set-top boxes. Networks designate a particular 30-second slot as “addressable,” meaning ads can be swapped in and out, then download a collection of ads to your box in advance. When the slot comes up, the box chooses which ad to play based on your cutover profile. Networks don’t know who is watching TV at any one time, so they target households rather than individuals using publicly available data. DirecTV (which I have) offers an advertising company 200 household attributes to choose from. Unlike online, ads aren’t micro-targeted with products you have searched for (yet), because it isn’t yet feasible to tailor expensive TV ads to very small groups. Instead, networks run a maximum of 20 potential ads in one slot. Agencies all know that targeted ads work – it’s why we love online ads so much. As companies develop new automated tools that can swap in the right ad with minimal human intervention, the price will drop, making more and more agencies interested in utilizing this type of technology. This will, without a doubt, also reignite privacy concerns. Networks do allow customers to opt-out of targeting, but they may not be aware it is happening. People just now seem to be aware of their opt-out options online and may be surprised to find they have to do it for television as well. Just one more challenge in the rapidly evolving world of advertising. Stephan Pastis is a Genius! Man crush aside, I want to skip the normal praise I would heap upon him for his writing, drawing, artful commentary, being so handsome, etc. and praise him from a marketing perspective. 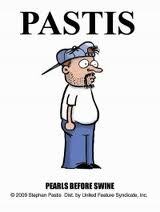 This weekend I realized that Stephan Pastis is a genius!